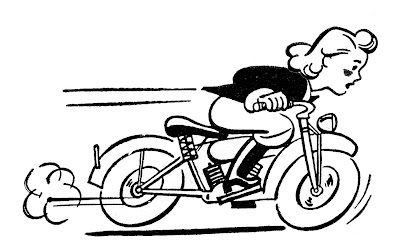 Today I’m offering this cute Retro image of a Woman riding a Motorcycle. I hope you’ll stick around for the rest of my post, there’s a GIVEAWAY at the end! I have to say I was ridiculously nervous about the whole thing, having never been on a Motorcycle before, but also intrigued. 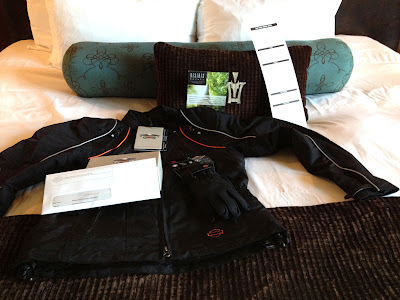 I knew I was in for an amazing experience when I opened the door to my luxurious hotel room at the gorgeous Iron Horse Hotel and was greeted with these gifts! A fab Harley Davidson Jacket with matching gloves and protective eyewear, too. Our first night there we were invited to a Garage Party at Hal’s Harley Davidson in Milwaukee. No not a garage sale … a Garage Party! These are super fun events that are held all over the country, at Harley-Davidson Dealerships, and they’re geared towards women! It’s an excellent way to get a taste of what it would be like to start riding. In the photo above we’re learning about proper riding gear. 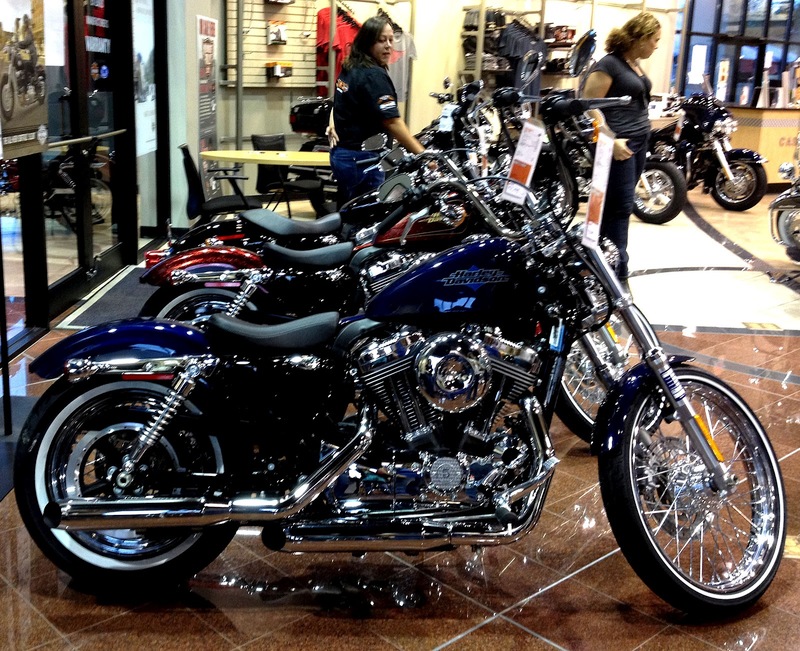 You also get to check out all the cool bikes while you’re there. I’m so in love with that Turquoise one!! It’s amazing how many choices there are! They explained to us that you pick out what you like, and what feels comfortable to you, and then they can work with your bike to make sure it fits you properly. Love that! Next they taught us how to pick a bike back up if ever you drop it. Here’s Kelly trying it out! Several of the girls tried it and they were all successful. It looked quick and easy actually. Next up was the Jumpstart. So fun! This is an actual Motorcycle that’s placed in a device to keep it stationary. It’s a great way to get a feel for the bike and try it out without actually going anywhere. A great confidence booster! Heather looks like she’s having fun, doesn’t she? If you’ve ever wondered what it’s like to ride a motorcycle I would encourage you to check out a Garage Party in your area, it’s a great place to start! It also makes for a fun girls’ night out, so grab some girlfriends and check it out … they also have really cute clothes there! The next day we went to HD Headquarters for a breakfast meeting. What a fantastic place! I’m going to do another post on my DIY Blog soon to show you some of the fab Industrial Chic decor at both Headquarters and our Hotel. Amazing! 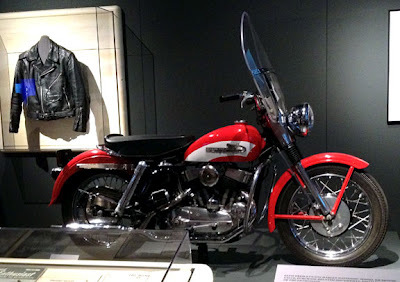 While we there we learned about the History of this iconic American brand. Everyone we met had so much pride about working there, and rightly so. They are committed to making quality products in America. Yay! We watched this video about Roshani, a young female teacher with 3 kids, who learned how to ride by taking the Riders Edge Training Course, which is offered at most Harley-Davidson Dealerships. It was so inspiring to see her story and how learning to ride a motorcycle really empowered her and gave her confidence. We all shed a few tears while watching it! We also learned about the concept of “No Cages”. Bikers apparently refer to cars as cages. When you ride a bike you are uncaged and free, out in the open. But it has a double meaning in that we often cage ourselves, and keep ourselves from trying new things, out of fear. When you try something new, like learning to ride a motorcycle, you free yourself from that inner cage. Love that! 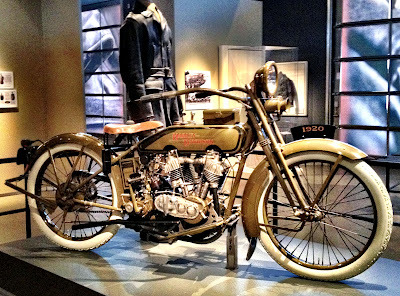 While were there we toured the Harley-Davidson Museum. What a cool place! 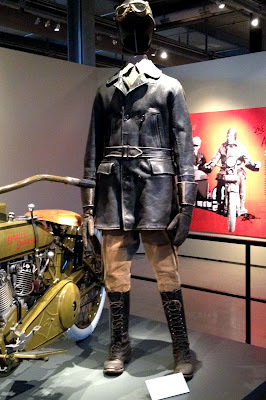 There was an exhibit called “Worn to be Wild”, that chronicled the history of the Leather Jacket. Which included this long 1920s Leather Coat. Of course I loved the Graphics Arts section!! There were so many cool and unusual bikes, like this Speedy Delivery bike. 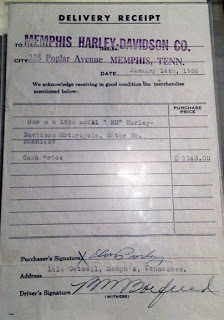 And this Harley that Elvis bought in 1956. They even had the original receipt with his signature on it! We were also taken back to the archives section to see the bikes that only come out on certain occasions. There were loads of them, many of them had fascinating stories attached! 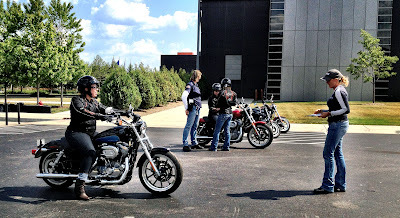 The most exciting part of the trip was when we took an intro class to motorcycle riding. This was a step towards The Rider’s Edge Program . I was nervous … so, SO nervous, I prepped myself by saying positive affirmations when I got up that morning! Yep, that’s me; I did it! I’m pretty sure I was the most terrified one in the group, but I pushed through and even though it was nearly 100 degrees outside that day, and I was nauseous from the heat, I made myself stay on until I was comfortable with it. And let me tell you it was AMAZING! I had so much FUN!! So confession time. I actually have a fear of driving … as in cars, or anything with wheels and a motor. I do fine around town, or in the country, but I have a huge fear of city driving, driving on big highways, tunnels, high traffic areas, or driving any place I haven’t been before. I can’t even begin to tell you how huge this was for me! What I found after this experience was there was a carry-over effect. The day after I got back home, I had to drive my son to a friend’s house in Virginia, about a half hour from D.C. , a very congested high traffic area. Normally I would have had tremendous anxiety, and would have asked my husband to drive us there. But I didn’t … I drove and I really wasn’t even nervous! In my book, that’s a pretty big deal, and I’m so VERY grateful for this experience. If you’ve ever wanted to learn how to ride, Rider’s Edge is the way to do it. The instructors are amazing, and the full course looks phenomenal. As a bonus, depending on your state’s laws, if you pass the course you get your license at the end of it with no additional testing at the DMV involved! Big thanks to our amazing teachers Deb and Tracy for being so patient with me. You girls rock!! Before this trip, I thought Harleys were for big burly men with beards. Now I know better. They’re for everyone, including women just like us! Why should men get all the fun? To read more about the other ladies experiences you can visit the Blogher Brand page Here. 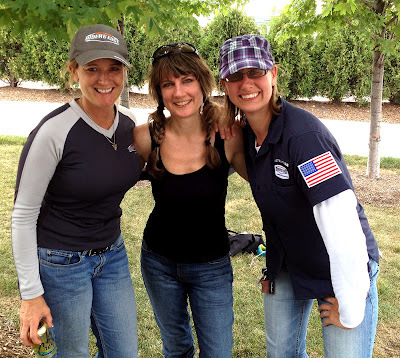 Want to read even more inspiring stories about Women who ride? Check out HD’s My Time to Ride Series or the Harley-Davidson Buzz Wall. Tell me what life with “no cages” means to you for a chance to win a Harley-Davidson Women’s Pink Label Embellished Nylon Jacket. 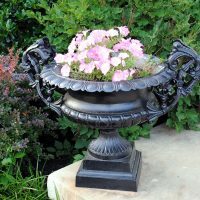 Be sure to visit the Harley-Davidson No Cages brand page on BlogHer.com where you can read other bloggers’ reviews and find more chances to win! I am totally stoked about this post… and here I didn’t realize how cool you all were. 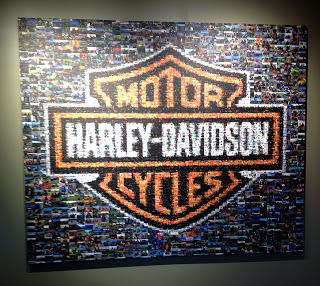 I am part of a Harley family… Not sure how many dudes you have rolling in for comment, but I have to say, great job! you all looked like you had fun…OK I grew ip 40 minutes from Sturgis…so of course I have been on a few bikes….no better way to tour the hills….great times and some crazy too…..one rule I learned Gravel roads are evil…when on a bike…not fun to take a spill. Fun! I recognize the group photo from another blogger I follow and thought it was neat to see you both together. 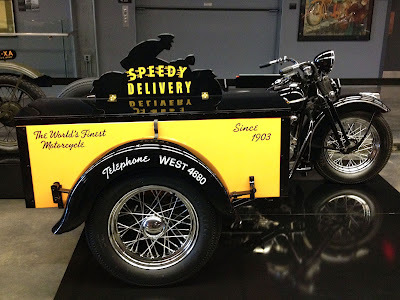 The idea of riding in a side car is the best my tummy could handle-ha! Oh my, you are so brave, after never having been on a motorcycle before … sounds amazingly fun!! 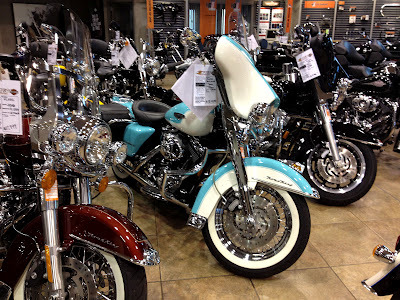 I’m so jealous…I would LOVE to go to Harley Davidson camp!! I’ve always wanted a “Bike”. For me snow skiing is living outside the cage!! Hi Karen! Everyday I come in to check your graphics out and love them! This one is soooo special. I ride and own 3 Harleys and am particulary stoked that you gained confidence from just being there!! I try to tell ladies that if you walk away with anything after meeting a lady rider, you will walk away with a feeling of self control and more confidence than you ever thought of having. I started riding at 50 and am now 58. I have ridden solo to Sturgis from So. California and that was a big deal for me. 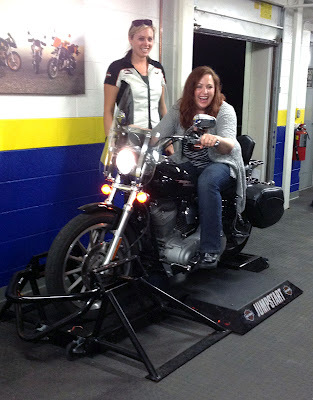 If I can ride a Harley at 4’11″… anyone can! Very happy you got a taste of the “freedom” we experience AND the comraderie given to each other! Special! Great job…I am proud of you. It takes a LOT to get on the front of a bike and begin to learn. I shook so bad and went so slow my instructor told me he had never seen anyone go that slow and still stay upright. I love it Karen!! So great to see you on the bike. So proud of you girl! Looks like you had a blast. No cages means to me…not being disabled and being able to leave this house! I have not always been disabled and I relived alot of memories from your fabulous vacation post, thank you! I love that Elvis had a Harley, too super cool! No cages to me means the freedom to go places with my girlfriends and even alone, rather than having to have a “man” to go with me. My ultimate triumph will be when I schedule that first solo out-of-the-counry vacation. No cages to me means………riding on my Harley wherever the roads take me without limitations and free from worries. I gave myself the motor cycle safety class for my 45th birthday present. Managed to run into the wall of the school because I was going to run over the instructor, he made me that mad. May be the Harley dealership class would be better for me. I LOVE to ride, but am a chicken at heart, so will learn from you. Thanks and keep up the “bike” posts!!! I’m taking some time off from work to get out of “the cage” now that I’m in my mid 50s. It has been schooland /or work since age 4 and though I don’t have much money and now I don’t even have health insurance(I’m working on that!) Ijust have to spread my wings. Loved your Blog about your trip Karen … & am dead jealous!! lol When is your bike arriv ing & what colour did your order? 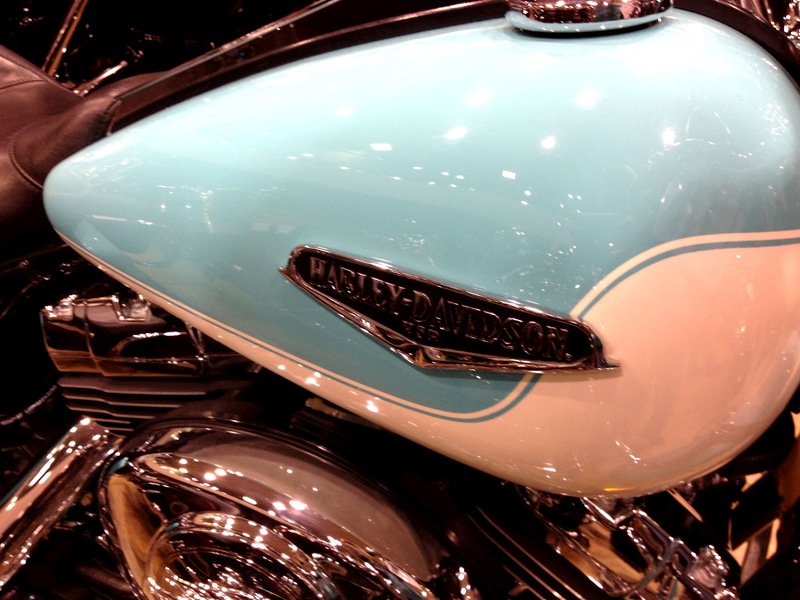 I would sooooo love to learn how to ride a Harley. I’d get rid of my ‘cage’, or the BMW that was my ex’s that’s sitting in the garage …. immediately. I have a major problem with balance, so not sure if I could actually ride one … but have been a pillion all over Oz … & adored it!!! I miss it soooo much & saddens me to see a bike in the garage, just covered over. 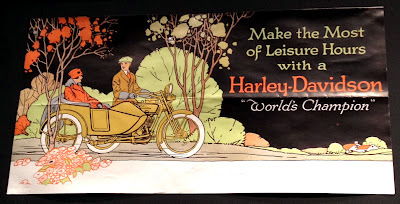 In fact 35 yrs ago, when I was living in the UK, I decided to return home to Oz … on a Harley. I’d chosen all the red leather gear, ordered the black bike … & spent hours & hours mapping out the trip. However, I started to get sick … & discovered that it was a tummy bug … but un fortunately … the tummy bug was destined to last 9 months! That was the end of my 5 year dream & I was truly devestated about the ride … although thrilled about the bug that was growing. That bug is now a 6′ 4″ Harley owner & lover … who also travels all over the world, but he flies … at the moment. lol We live too far apart for me to be able to ride with him (if he’d take me) … so I’ve decided that the on ly way this 60 y.o. grandma is going to have to get her own leathers & bike! I have a brand spanking new helmet .. just waiting to be used!! 🙂 I dream of riding a motorbike instead of my main wheels being either a ‘cage’ or motorised w’chair! I wonder if it would be possible to teach me to ride alone?? What do you think?? Director before retiring in 2011. My husband & I have a 105th Anniversary Screamin’ Eagle Ultra Classic & love to ride (when the weather is not so darn HOT!!)! Harley-Davidson is a great company & the Garage Parties & Rider’s Edge are both wonderful opportunities to experience the lifestyle. Wow! What an exciting accomplishment! And how cute you looked on the bike! Wow! I’m a chronic nervous driver. Truth be told I’m scared of bikes that don’t have engines. However, this post has me thinking like the little engine…I think (maybe) I can 🙂 I certainly would like to give the turquoise bike a try! No Cages? to me means that I’m free to do what I want, when I want to. Having a Harley, or a man with a Harley would definitely be a bonus! How fun! I have never been on a motorcycle before but maybe one day I’ll be brave enough! You must have been in heaven surrounded by those vintage bikes. Love the graphic! No Cages = NO FEAR! Even if you have to fake it, ’til you make it. Just like you did, Karen!! Congrats on facing your fears, head on! It’s hilarious that you just posted this. I REALLY want to learn to ride a motorcycle! I am going to check out Rider’s Edge for sure. To me life with no cages is living to the fullest – doing things that scare you – and realizing you can overcome them! So proud of you for riding, Karen!! Happy to have discovered your blog. My name is Karen as well and I used to ride on the back of a Harley before it was exchanged for a jet ski to park behind our cottage on a lake in Maine. Love your blog! Such inspiration and a great post…NO CAGES: doing something that you are afraid to do, but do anyway, and release that fear! Now that’s true freedom from being ‘caged’! What a fun opportunity! Sounds amazing! To me life with “no cages” means living a life with complete religious freedom. I believe if you don’t have that you don’t have anything. life with no cages means alot to me. my boyfriend rides so i know what your talking about as far as riders go. as far as life goes, i was diagnosed with bile duct cancer about 8 months ago at age 38 and this has totally transformed me. now that i am done with chemo & radiation, i have been given a second chance at life. God has blessed me and i want and will make the most of every day. my boyfriend & i have plans to travel and do things we never have before. i want to live life like every day could be my last. thats what life with no cages means to me. Awesome Fun and Good for You!!! Major props for the Rider’s Edge course – I can’t begin to describe what an awesome class it really is. Regardless, it was the encouragement I needed to take the course and get my license. I’d never ridden alone so I was super nervous, more so when I went to the first class and was the only female with about 25 men. I went in knowing literally nothing, and upon completion I was riding confidently and safely on my own (with no spills or mishaps in between). Today I don’t just have my motorcycle license – I have my own bike. Hi Karen ! I’m happy to see that I am not alone with being contaminated by the HD virus ! At this point, I’m going to travel the entire ocean, stop in San José, rent an HD and drive along the Pacific cost with my eleven years old son ! This is our first bike trip together, and we are expecting this moment with emotion ! We will publish it on mobilytrip, and I hope that is going to be a good time ! What a fun post!! My husband loves motorcycles, and I used to love riding with him. He sold his a few years back b/c we needed a new family car. :s Love that beautiful turquoise bike! Do you live in Virginia?? I’m about 50 minutes South of DC….it is scary to drive up there! How fun! My sister rides, and I have been getting curious myself. Thanks for sharing your experience. 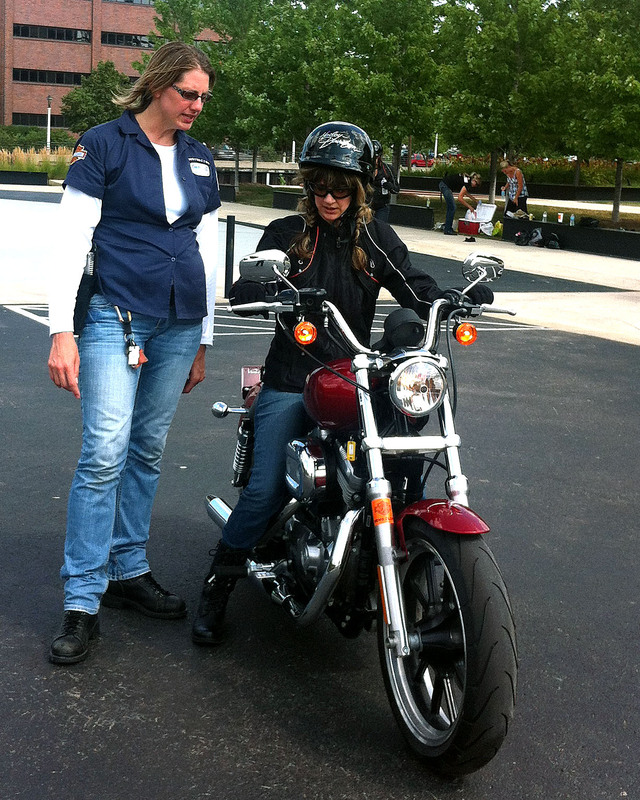 Having my own Harley is a goal of mine as soon as I retire – wearing the jacket to work would be an inspiration! So proud of you!!!! Living “out of a cage” to me means trying new things. And boy did you try new things!!! I also wanted to “thank you” for all your hard work. I love all your graphics and appreciate the time you put into it!!! 3 weeks ago, we spent the day with my 74 year old dad who was buying his first bike and he did it with class by choosing a Harley. He actually got a trike and we couldn’t be any more happy for him 🙂 I don’t know who was more excited, me or him. No cages to me means being free to roam the world without looking back! What an amazing experience you’ve had. So fun! No cages to me at this point in my life … almost 65 [yikes] means being free from the cages of “What will others think if I _______ or if I don’t _______.” The freedom to know who I am and really like that person. No cages isn’t necessarily “doing,” but “being”!! “No cages” to me is the determination to live outside the fears that constrain us and keep us from being all that we can be. Life without cages…to me that means being able to live without fear keeping me down, to know that I can go anywhere and do anything if I put my mind to it. Traveling on my own gives me such a feeling of empowerment. It helps me realize that I’m more than just a wife and mother, that I’m a living breathing person with a life all my own. You rock! Loved reading about your summer camp experience. No cages means a great husband who doesn’t mind that I have friends who make plans to do fun things or just get together to eat out. He will not starve to death while I’m gone, he can entertain himself. Our daughter grew up going shopping or to concerts with her Dad as much as with her mother. I got a jewel & love him. Loved hearing about your biking adventure! what a fun blog you have..thanks for sharing your adventure. I would have given my left leg to be a part of this blogger group. 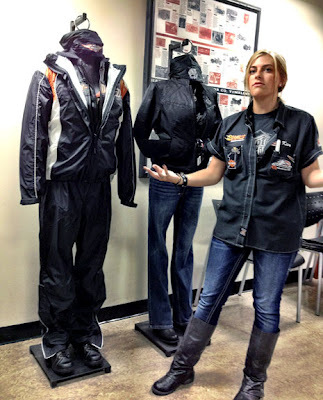 I love anything Harley and would love to win the jacket! No cages means freedom from work – able to do what you want when you want! 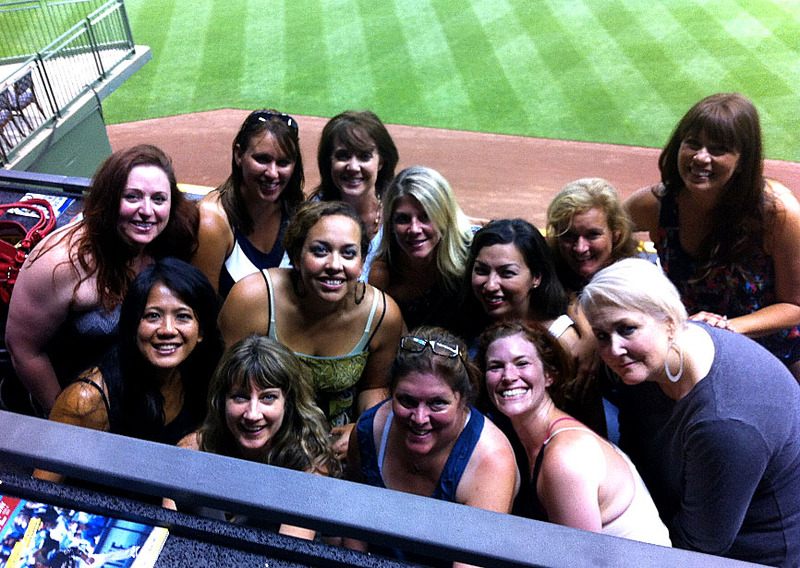 What a great experience… sounds like you had a fantastic time! I started out riding as a passenger on a (now) ex-boyfriend’s bike… caught the bug, and always wanted to be able to ride on my own. I took the Rider’s Edge course last year and it is definitely worth it. Being cage free to me means having the confidence and know-how to do what you want to do. Life with no cages to me would mean, quitting my job and being able to do anything I want, whether it be working on my arts/crafts all the time or touring all the states of the good ole USA!!! You go girl! It’s one of the items on my dream list to ride a motorcycle…..hopefully better than I drive a car…not certain about that logic, but I’m running with it! No cages has a more figurative than literal meaning. As we get older, we get a better feel for what that means. It doesn’t mean you get to do anything you want to do without regard to others, but it means being true to yourself, being a good world citizen, and leading a life that leaves you as free as possible from regret and other negative feelings. no cages to me is living without fear and trying things i am now afraid too. better health too. No cages for me would be to be able to quit work and have time to be creative all day, to find a way to make a living with art – doing what you love so it is not really like a job. Also the freedom a little more money would allow to move where we want to – out of the city. I dream of no cages. Love your graphics and love, love, love this post! No cages to me means having learned the hard way I am stronger and braver than I ever thought I could be and really can do those things I thought I couldn’t. I began my ‘no cage’ life at 62. I am now 68. Messed up in my first Rider’s Edge class, aced the second. 🙂 Started out with a used Buell, went to a new trike, then a 2011 Ultra trike. The 2011 has 28,000+ miles on it(in 18 months). We are retired and ride together a lot, and we ride with our HOG chapter. Our dealership (Cycle Connection in Joplin, MO) sponsores 4 Rides of Distinction a year. No Cage=Freedom of the Road ! I started my ‘no cage’ life at 62, I am now 68. It was either that or never see my husband . 😉 Messed up my first Rider’s Edge, aced the second . Started out with a used Buell, went to a trike, now riding a 2011 Ultra trike. It is 18 months old and there are 28,000+ miles on it. DH and I ride a lot, either by ourselves or with our HOG chapter. Our dealership (Cycle Connection Joplin, MO) sponsores 4 ‘Rides of Distinction’ every year. We did Hill Country in Texas and Rolling Thunder in DC. 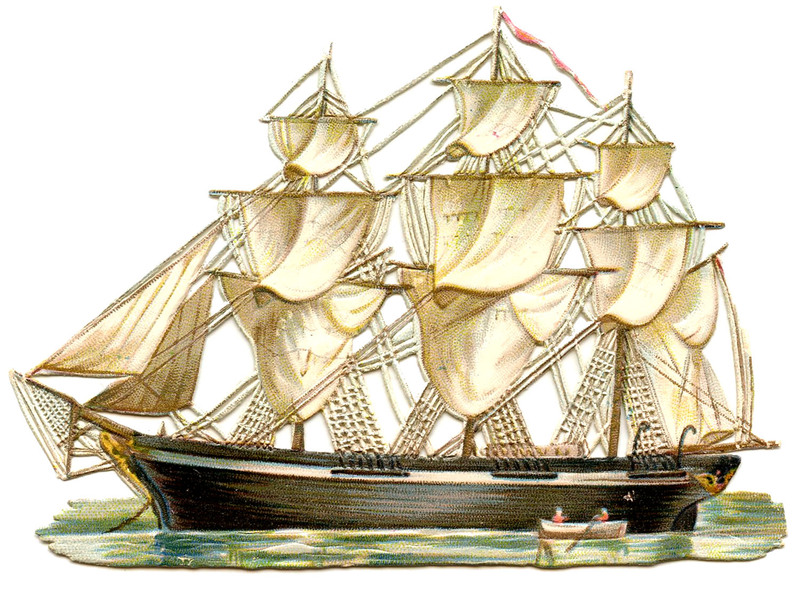 Next month we will go to Savanah & St Augustine. No Cage=Freedom of the road ! No Cages: Free to be me, to finally put myself first. To let go of all the garbage. Knowing I can accomplish anything. Anything. i loved your post…SO inspiring! ‘No Cages’ to me is to constantly try and/or learn new artistic things…there is no ‘right or wrong’! For me, no cages means no limits. It means no predetermined destination. It means living life without the oppression of someone else judging your every move. It means daring to be different, to make waves, to be the lone pair of cut-offs at the black tie affair. It’s not just the freedom to do or to say or to think, but it’s the freedom to be. Just checking in to post a comment because I love riding with my husband! We have been riding together for 15 years, he has a Fat Boy. I really need a cool new jacket and I hope I win this beauty!! Thanks for having this contest…you are super cool now that you can ride all by yourself. I used to ride by myself, but that was years ago! Here’s a link to my tweet on Twitter….https://twitter.com/MyWeddingStudio/status/234921002138755072 and I also plugged your blog. 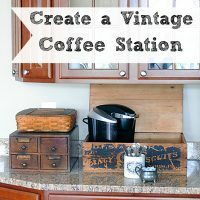 I love your graphics, you work hard to gather all these cool vintage images and you share them for free. Thanks a bunch! Life with no cages would be people not having to rely on their cell phones to survive. Thanks for the opportunity to enter this givewawy. You ROCK and are an inspiration to all women, including girls. You are not only creative and successful but also know how to have fun. love the retro bike. I would have never thought I would see a Giveaway for a Harley Davidson Jacket on a graphic site. I use your site quite often for inspiration. Also love the pick up your bike demo. Saw that at a dealership once. If you are gonna ride you gotta pick up your bike. What fabulous fun for you! No cages =s freedom to drink in the scenery, the fresh air, and the thrill of the ride! OMG. I linked into this post randomly and am truly in awe. You rock! No cages: Something I do every Sunday when I walk the trails of our Forest Preserve, after I feed a Red Tailed Hawk that I’ve been working with for almost 20 years. It’s how I worship every Sunday morning! Sounds like you had a great time. Nice that they taught you so much. Hope you are over your fear of driving. To me “no cages” describes the way I feel when I am scuba diving. Complete freedom. Love seeing the ocean floor with all its wildlife. I posted the link-back on my profile page & highlighted it. If I win, that means my hubby will have to get me a bike!! Vroom! I love it! So glad you had that opportunity to do that. My husband is a retired motor cop rode his Harley for 12 years of his 25 yrs of service. 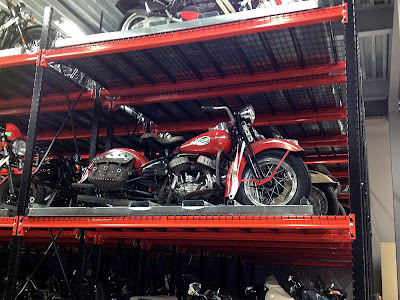 Our home is filled with his Harley memorabilia…I would like something Harley for myself and a pink jacket would be just that! Freedom to ride a Harley and with a pink jacket…wind blowing in my hair well the hair not under the helmet….Please enter me and thanks. Life with “no cages” to me means that I would get out of that stupid 9am – 5am job/ and finally get to do something fun when I want to. Looks like you had fun, having a mother who is a Harley Chick, and a husband who tears apart and rebuild motorcycles I am still hesitant on trying to learn to ride, looks like an awesome experience, maybe one day I’ll try it myself! 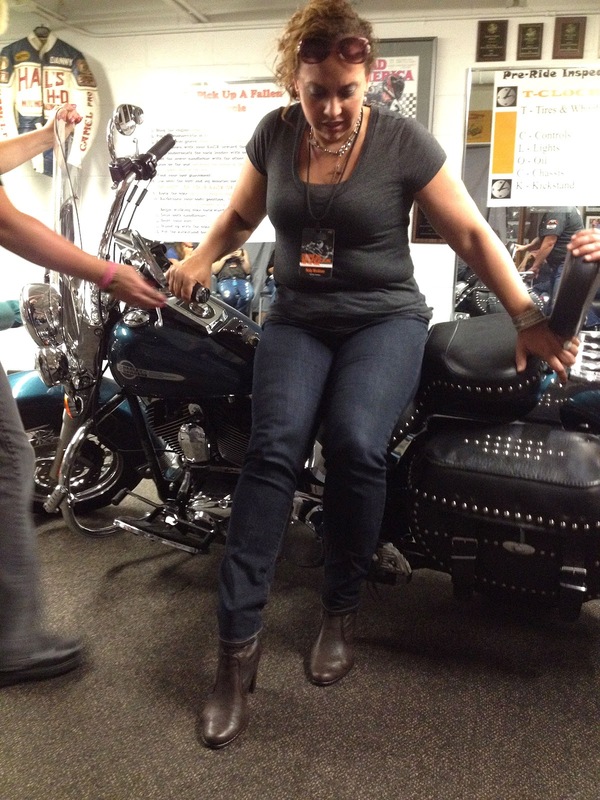 Loved you blog on your Harley class.I have always wanted to take one..Fear has keep be away. I am a back seat Harley rider.. open cage means to me..when I am on the Harley with my husband ,,I love how different things look and smell, while riding. we have road as far up Mt hood as we were able . We have road to the top of Mt Rainer, we have road to all the waterfalls in OR. All over Pugent Sound WA.many place in CA also..things look smell and feel so much more on a Harley.. my Hubbies is a 1991 Fat Boy! It means to me to live life to the fullest. I love Harley Davidson Bikes and I LOVE to ride! I have friends that I ride with, but lately I have really gotten that urge to drive myself! (no more “sidewalk biker” status!) lol I enjoyed reading about your empowering adventure and I have to tell you…. I am now offically inspired!I will be riding solo on a sportster in no time! To live life with “no cage” is to dig deep within ourselves and free ourselves from our own personal fears! I admire your courage! My husband loves to ride and has asked me to do this…….. hhmmmm….. maybe someday when i work up the courage! Take care! No cages to mean means finally getting out and doing what I want without reservation or permission/the ok from someone else. Hi, I used to work at the company that made the heads and the intake manifolds for H-D. What a great company, I grow up in a family of riders,and with that we always felt free, I got it right away when I seen the ad. Cause that is what H-D has always meant to me, you could do anything be anyone. No boundaries. It was great hearing about your experience. That would be awesome to see all those bikes. I love your site! I have been here before and had trouble selecting and downloading the graphics, but I need one now and you were the first person I thought of 🙂 Great prize, maybe I’ll win! The meaning of no cages for me is living life to the fullest, without restrictions, taking chances! It means living life without restrictions. No cages means, trying to reach your goals fearlessly! Thanks for a super giveaway! No cages means letting go of the past and moving forward without regrets! Thanks for the chance to win! Wow! Those are COOL bikes! But what’s even cooler is you getting out of your shell, facing your fear and enjoying the ride! It only takes a little courage to face your fear in life. Hmm, you’re so proud of yourself, aren’t you? Congratulations on this awesome adventure! Garage parties do sound like a lot of fun! I’m glad that attending it helped you conquer your fear of driving. I’m really jealous! I’d love to have checked out the HQ as well. 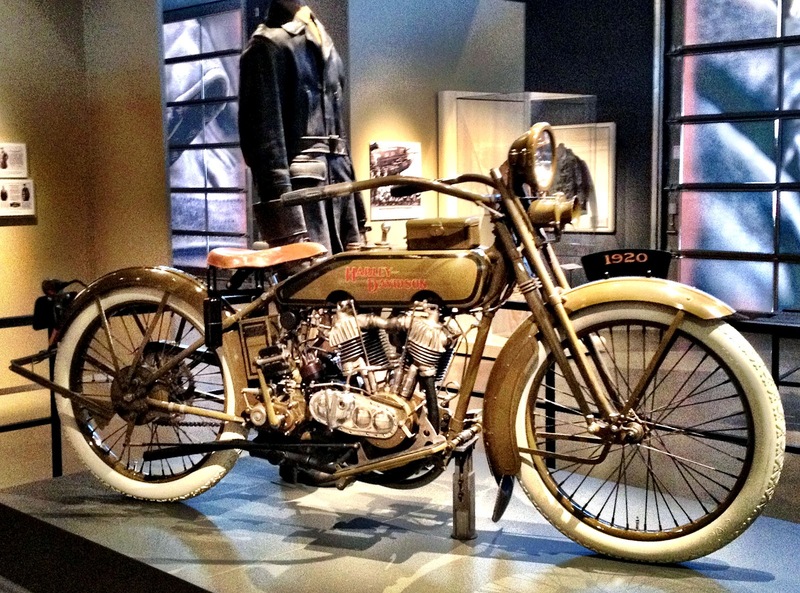 Harley Davidson as a brand has become an integral part of American history and culture, so to see how it has evolved over the years would be really cool. I’m so glad you were able to use this experience with the Harley Davidson Garage Party to overcome your fear of motorbikes! I know the very thought of riding such a powerful vehicle can be quite intimidating to many women, but then that’s why HD is holding these parties. It’s to encourage women to join a one-of-a-kind revolution, and in the process become a very unique person themselves. I absolutely adore these garage parties! It’s so great that a highly-respected and widely-recognized motorcycle brand wants to empower women, and show the world that women can ride a bike just as well as men can! I hope one of these Harley Davidson garage parties comes somewhere near me, so I can attend one.